Here is a wiring harness junction box bracket. This is for driver side kick panel. It will fit TJ 2000-2002. The part number is 56019685AB. 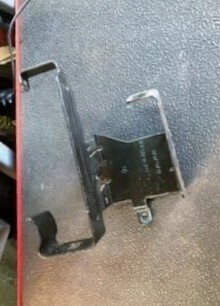 It was removed from a 2000 TJ. This may fit other models or years, please check your application. Used parts are expected to have some wear, surface rust, scratches, etc. Be sure to check out the pictures!